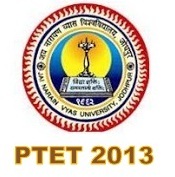 PTET Admit card 2013: Jai Narain Vyas University (JNVU), Jodhpur (Rajasthan) has issued Admit card 2013 for PTET Exam 2013 on its official main portal for those Graduates candidates who have filled Pre Teacher Education Test (PTET 2013) online application form. PTET Admit card 2013 can be downloaded from below website link as PTET Exam 2013 is scheduled to be held on 5th May 2013, Sunday at various centers in Rajasthan. Download PTET Admit card 2013.